Are you ready to get your community into the reading groove? Well check this out... Every year Mad Science of Sno-King develops a customized, interactive show that ties-in to the Collaborative Summer Library Program. Our shows offer an exciting way to ignite the imagination of young readers and can be used to kick off, support, and celebrate your summer reading theme. We offer a variety of programs to libraries throughout the year and are eager to partner with you. Let's work together to rock and enrich the young minds in your community. Join our Mad Science Maestro in this ear pleasing show about the science of sounds. 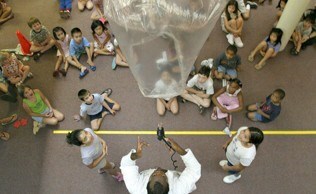 We'll pump up the volume and explore sound as it travels through solids, liquids, and gases. Listen to the beautiful tones of Mad Science resonance tubes and take a trip through the jungle as we recreate the roaring sounds of creatures large and small. Or maybe it's a rain forest as we recreate an indoor thunderstorm. We'll manipulate sound waves to create hilarious effects using our Mad Science sound machine! 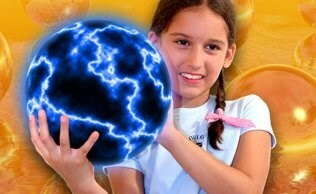 This Mad Science show is sure to inspire imaginative learning in your community and help children feel the summer reading vibrations! Engagement - Our shows are high energy and always include volunteers. Age Appropriate - Each presentation is tailored to the age of our audience. With Mad Science shows, children from kindergarten through 6th grade are involved and engaged with our open-ended science activities. Highly Interactive - Our Mad Scientist puts the wow in science interacting with your audience with fascinating experiments and demonstrations. Action Packed - Shows range from 30 - 60 minutes. Adaptable - Presentations are suitable for groups of any size. Affordable - "Sounds like Science" is $375 per show (travel fees vary depending on location). Hassle-Free - We supply all the materials and supplies. We just need a table, some room and the kids.